In a part of the world that is experiencing the most dramatic increase in temperature and climate change, two very similar species of animals are responding very differently. New research published today suggests that how these species have adapted to co-exist with one another might be to blame. Chinstrap penguins whose namesake describes the black stripe under their chins are decreasing in number while Gentoo penguins, recognizable by their bright orange beaks, are increasing at summer breeding colonies in the Antarctic Peninsula. This research sheds light on the different strategies these two similar species have carved out over time to reduce competition for food, and the ramifications these different strategies are having now during a time of rapid environmental change. 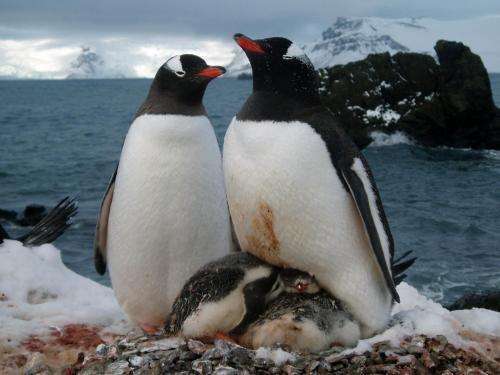 "Our data shows Gentoo penguins have a more diverse and flexible diet than Chinstrap penguins, which forage farther offshore and preferentially feed on Antarctic krill during the breeding season," said LSU Department of Oceanography and Coastal Sciences Assistant Professor Michael Polito, who is the lead author on a paper published in Marine Ecology Progress Series. 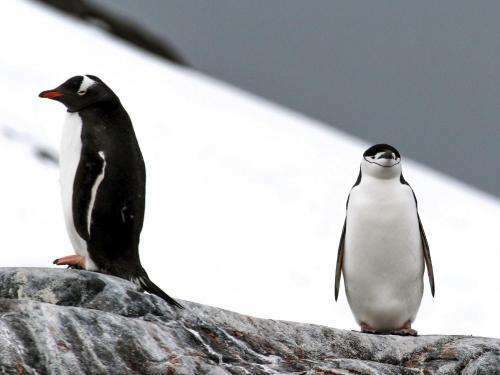 The potential for these two penguins to compete for food is highest when they are found breeding near each other on land and the need to feed their chicks daily restricts the distance they can search the ocean to find food. However, the key differences in what they eat and where they look for food likely evolved over time to reduce competition and to help Gentoo and Chinstrap penguins co-exist. The Antarctic Peninsula has warmed dramatically over the past 50 years. The annual air temperature has increased by about 5 degrees Fahrenheit, or 2.8 degrees Celsius, which makes the Antarctic Peninsula the fastest warming region in the Southern Hemisphere, according to the British Antarctic Survey. "For a region that for most of the year hovers around the point of freezing, a few degrees plus or minus is the difference between freezing and melting, particularly of sea ice," Polito said. Penguins' main prey, Antarctic krill, which are shrimp-like crustaceans, rely on sea ice. Young krill in particular use sea ice for protection from predators, and they feed on algae that grow beneath the sea ice. As temperatures warm, there is less sea ice and therefore fewer krill for penguins to eat. 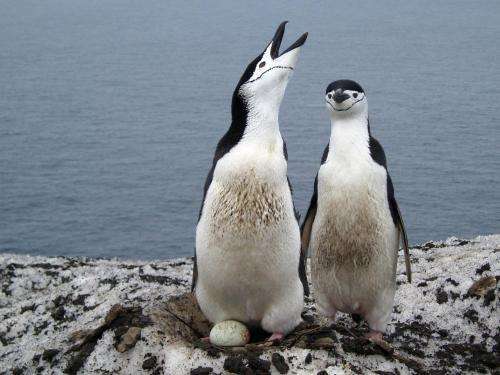 While in the past, over evolutionary time scales, Chinstrap penguins' strategy of foraging for large, predictable patches of krill offshore made sense. But now as krill have declined, this specialist strategy may not be best suited for today's conditions. In contrast, Gentoo penguins seem to be better adapted to deal with a changing environment. In addition to their dietary flexibility, they are also more flexible in when and where they breed. They also likely ease the transition of their chicks into adulthood by feeding them for a longer period of time. "These may be the reasons why Gentoo penguins in the Antarctic Peninsula are benefiting from changes in climate and their populations are increasing, but Chinstrap penguins are decreasing," Polito said. Polito and his colleagues applied three methods of data analysis to substantiate how these two similar penguin species' behaviors differ. Over five years at a long-term field camp that is part of the U.S. Antarctic Marine Living Resources program run by NOAA National Marine Fisheries Service, researchers examined the stomach contents of breeding adult penguins. This data provided a snapshot of what an individual penguin was feeding its chick that day. In addition, by identifying the ear bones of fishes, or otoliths, consumed by penguins, they were able to determine if penguins were feeding on nearshore or offshore fish. Lastly, the researchers collected breast feathers from fully grown chicks and analyzed them using a technique called stable isotope analysis, which allows them to identify how much krill versus fish an individual chick was fed by its parents. This step further corroborated the stomach content and fish otolith analyses. "Any one of those three methods, such as looking at stomach contents, identifying otoliths or using stable isotopes, will give you some information. But using all three combined gives you a much clearer picture of what's going on," Polito said. While this research studied the two penguin species during the breeding season when the potential for competition for food is highest, Polito and his colleagues are pursuing research outside the breeding season to see if the same patterns exist. LSU graduate student Rachael Herman is furthering this research by investigating whether Gentoo penguins all eat a wide range of prey or if each individual specializes in something slightly different. This will help to determine if all Gentoo penguins are benefiting equally from climate change, or if only a subset of individuals are pre-adapted to deal with today's rapidly changing environment. "Climate change does not bode well for picky eaters" and only slightly less well for those of us that survive them who eat anything and everything that's left.